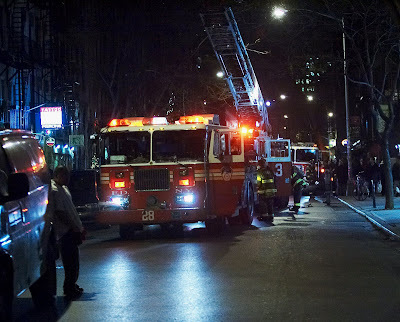 FDNY at the scene after successfully dealing with the fire situation at 120 St. Marks Place . Benjamin Shaouls 120 St.Marks Place with combo piercing salon , tattoo parlor and bong-shop in a space that he originally lawfully agreed to rent as a community facilitiues space . Mr. Shaoul has yet to lawfully rent any of the original lawfully agreed-to community facilities spaces to a lawfully qualifying community facilities tennant . 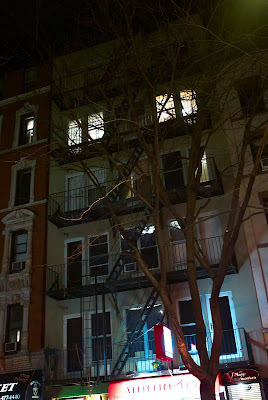 Early Friday evening we received a call alerting us to a fire with smoke issuing from the upper floor of the building at 120 St. Marks Place . We rushed to the scene because we did not know how big the fire was and we also knew that this building , being a brand new building with 7 outstanding violations , in excess of $20000 in unpaid fines and no currently valid certificate of occupancy ( see NYC DOB building profile for this building at http://www.nyc.gov/ ) , was constructed using light gauge steel structural components . Light-gauge steel structures even though required to be "fire-safed" with fire-blocking , a variety of insulating materials and occasionally sprinklered , are one of the least likely kinds of structures to survive a fire . Light-gauge structural systems are of course also one of the least expensive structural systems available and are thus widely used in our city . This was not a big fire fortunately , just an oven fire according to FDNY at the scene . 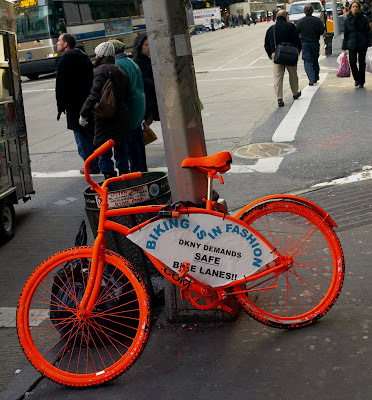 The City of New York is currently involved in a pilot program to investigate and re-consider the use of light-gauge steel structural components . FDNY will of course participate in these hearings . 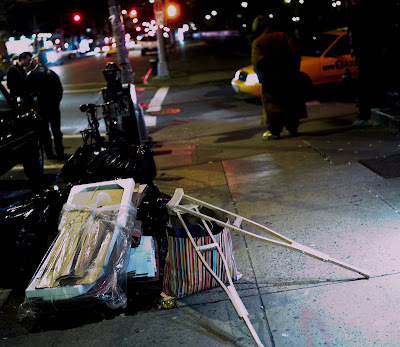 Currently FDNY is reluctant to enter any burning building constructed of light-gauge steel structural components because of the greater likeliness of early and unpredictable collapse during a fire . FDNY is not alone in its official reluctance to enter such light-gauge steel structures during fires , the Los Angeles Fire Dept . , along with many other Fire Dept.s in many smaller juridictions , are also reluctant to enter burning buildings constructed of light-gauge steel structural components . Of course all of these Fire Dept.s will enter these buildings to rescue trapped individuals , they just will not enter these buildings to just save the building .... they see it as too dangerous to risk lives here just to save property especially considering that such property was built on the cheap . We also consider that in some cases such light-gauge steel structural systems can be safely used. Its just that we fear that in far too many cases these structures of light-gauge steel component s are not safe because to construct them properly as safe structures the process of design and assembly is too complicated and demanding to be successfully mastered and reliably practiced by many architects and contractors . 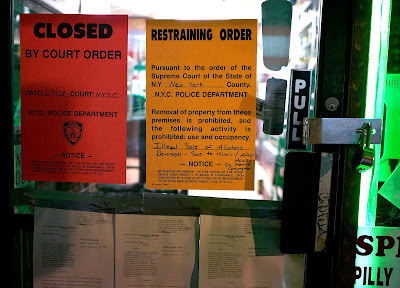 Closed and padlocked by an NYPD team including members of the 9th precinct , Emergency Services personnel and members of the NYPD Legal Dept. 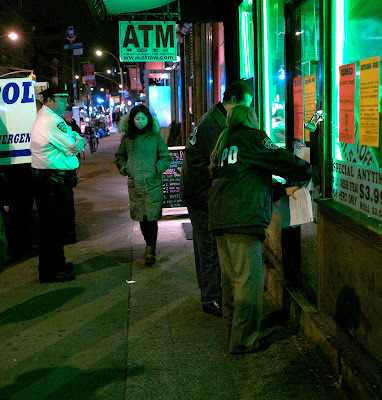 for the sale of alcohol to a minor , 50 Avenue B will not be open for business this weekend . The convenience store's owners will lose a good bit of business this weekend . 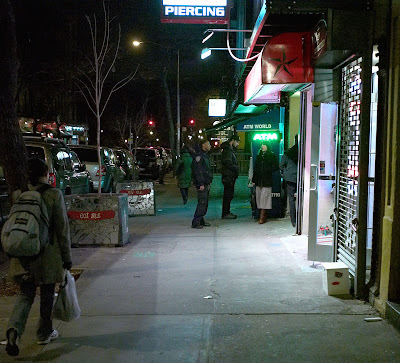 With the commander of the 9th precinct Deputy Inspector DeQuatro present NYPD Emergency Services personnel place a padlock on the convenience store's front door. Members of the NYPD Legal Dept. post legal documents explaining the closure of the convenience store for the sale of alcohol to a minor . 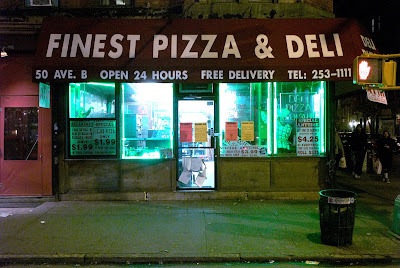 The popular convenience store "Finest Pizza and Deli" at 50 avenue B , the corner of 4th street and avenue B , stands closed by NYPD Thursday night . 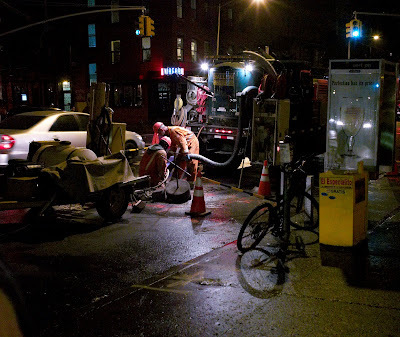 For more than 2 years now Con Edison has been drilling for gas out front of Ray's Candystore at 113 avenue A ....and they keep finding it . Once when we were younger and living in another more western state we were employed drilling for gas . Hole after hole after hole was drilled but we rarely found any gas. Here at Ray's , Con Edison easily succeeds in finding gas because old , buried gas pipe and fittings leak . Yes , check it out . Read the comments at both sites .This story refers to some of our pictures that are here on NMNL so we point your attention in it's direction . 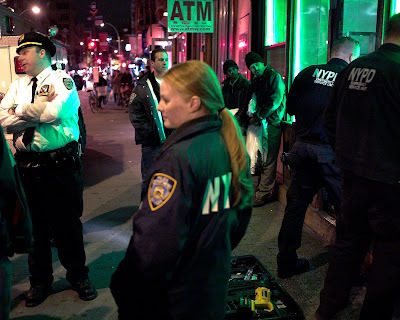 We tried to comment at the Observer but their system would not accept our comment detailing the eviction attempt that he unlawfully made at 120 St Marks Place back in March of 2006 . 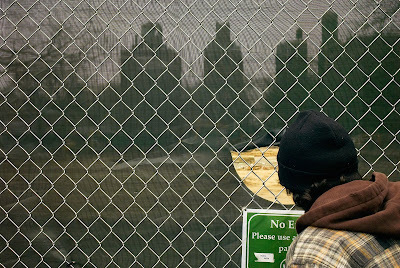 Mr. Shaoul was questioned by the Observer about what we pictured that day and has his own inventive take on it all . You can read and see our take on it all complete with pictures right here at NMNL . Take a look at the comments with the Observer story . Amazingly there are folks out there that persist in believing that this guy is a sweet , modest , innocent young miracle working Boy Wonder : our experience with him at a distance and up close and personal is quite to the contrary . Use the "Blogger" search feature in the upper left-hand corner of the page to explore the assembled posts concerning "Benjamin Shaoul" and "120 St Marks Place ". 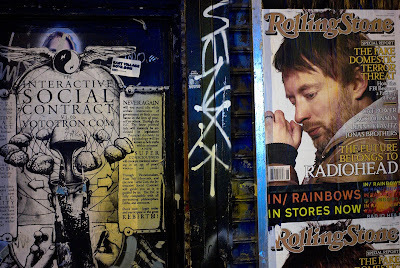 Have fun comparing and contrasting NMNL and the NY Observer on the subject of Ben Shaoul . "Google" and "Yahoo" him and his company Magnum Management too. Today our gaze above is on a green veil , a vague urban skyline and an umber , scarred bit of earth where once there was a perfectly satisfactory and functional fountain . Someday when all work is done in this park , someone's obsession with their special mind's-eye view of a fountain , arch and avenue will have been made manifest ... with a fountain , an arch and 5th avenue all precisely in alignment . In another time someone in another great city had an obsession for a special mind's-eye view of a great basilica . In Rome Il Duce demolished a whole section of Roman buildings , and the mystery that dwelled with them , to provide a broad , open and direct way of procession ( the Via della Conciliazione ) to , through and past a series of more-or-less aligned objects ... an obelisk , an elliptical colannade enclosing Saint Peter's Square and Saint Peter's Basilica . Most who dwelled in Rome then and most who live around Washington Square Park today did not want their urban neighborhood changed radically to make real some elite's eccentric and tedious vision . But , here and there , then and now , political elites have the power and they seem to inevitably prefer obviously simple geometries inscribed large on grand scale . .